BRITISH COLUMBIA – Toronto-based Seabridge Gold continues to drill at its KSM gold project 65 km northwest of Stewart with excellent results. 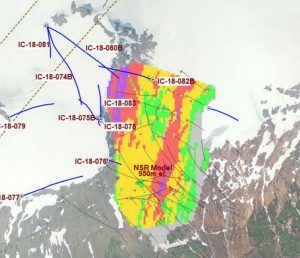 The company said that recent work extended the high grade Iron Cap zone down plunge to the northwest, but drilling also delineated the southern limits of the zone. One of the best holes, IC-18-83 assed 0.63 g/t gold and 0.44% copper over 548 metres, including 133 metres of 1.31 g/t gold and 0.57% copper. Drilling in the northwest plunge of Iron Cap followed up on results from the 2017 exploration drilling. In addition, a potential conflict between the projection of the deposit and the proposed MTT haulage tunnel was resolved. More detailed recent drilling results are available at www.SeabridgeGold.net.